Mexican style breakfast, fried eggs (over easy) served over corn tortillas topped with a tomato based Ranchero sauce. Served with Mexican Rice and Pinto Beans and cheese on top of Beans. Mexican style beef sausage (chorizo) with scramble eggs. 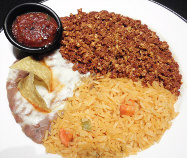 Served with Mexican rice, pinto beans and a choice of corn or flour tortillas. Fried tortillas simmered in a red Spicy salsa and your choice of eggs on top. Served with Mexican rice and pinto beans. 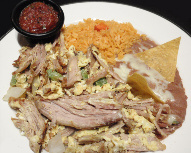 Mexican style breakfast, marinated shredded beef with scramble eggs. Served with Mexcian rice, pinto beans and a choice of corn or flour tortillas. Flour tortilla with Jack cheese, scramble eggs, Mexican potatoes and pico de gallo. Breakfast Steak and Eggs with Hash Browns. Seasoned and Grilled Breakfast Style Steak. Served with Three Eggs (your choice of eggs) and Hash Browns. Come with: Ketchup (3 pouches), Steak Sauce (1.5oz), Salt and Pepper on the side. Three eggs with bell peppers, onions, tomatoes, mushrooms and cheese. Served with white or wheat toast and Hash Brown. Two slices of toast dipped and grilled in a cinnamon egg batter, topped with powdered sugar Served with three eggs ( your choice of eggs) and hash browns. Come with: Syrup, Ketchup, salt and pepper on the side. Two Homemade pancakes topped with powdered sugar, Served with three eggs (your choice of eggs) and hash browns. Come with: Syrup, Butter, Ketchup, salt and pepper on the side. Three Homemade Waffles topped with powdered sugar and strawberry sauce served Served with three eggs (your choice of eggs) and hash browns.